Upon running `lxd init` I found I needed some additional kernel options to support network bridging. I don't recall the specific ones, but they were recommended to me in the last step of `lxd init` when I said yes to "Would you like to create a new network bridge?" ..
Now, I can only boot when I unplug my USB Ethernet adapter. The kernel crashes shortly after plugging it in with a long stack trace that exceeds the console's height. I can not access any other tty when that happens. There is no X desktop on here yet.. I'm not sure how to debug this. How best can I proceed from here given that I need both LXC and the USB Network adapter? This does not appear in /var/log/messages .. this is everything I can see. Some sort of semaphore page fault. This is a hardened SELinux kernel. I swapped it out with a simple non-hub ASIX USB Gigabit Ethernet adapter and it did not crash.. 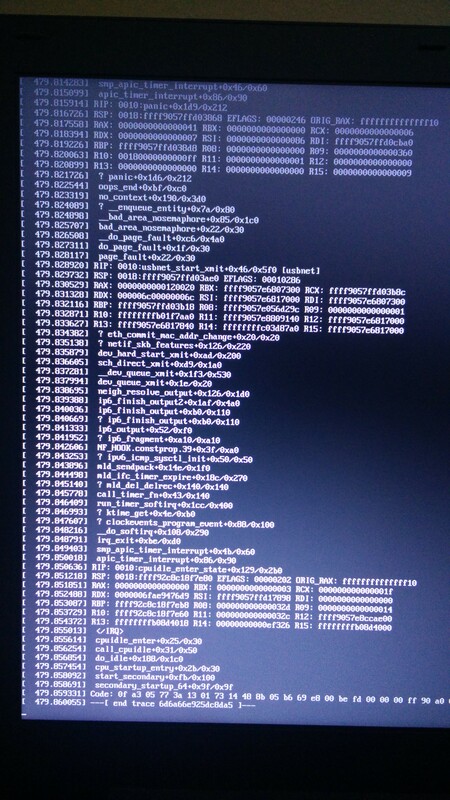 The backtrace is due to a kernel panic. You have hit a kernel bug, likely in code specific to the USB Ethernet dongle. Please try a newer kernel, as 4.12.x is no longer supported upstream.